This is a young, healthy adult frog. As they age they develop white spots usually on the flanks which is a normal colour change. 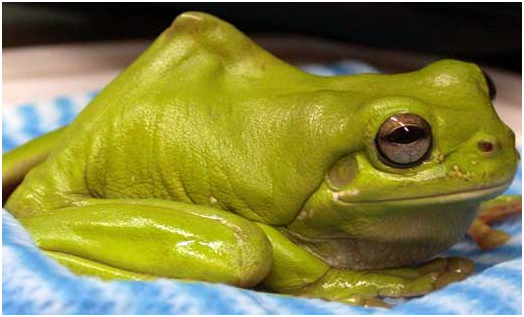 This is what a frog with oedema looks like. A bit like someone has blown it up with an air pump. oedema can occur in the body cavities or in the subcutaneous fluids like in this frog. This frog was still alive (barely) when this picture was taken. It was found laying upside down on someone’s lawn. Its pupils were tightly constricted.- something you might see in insecticide toxicity, but there was no fitting. Cause of death remains unknown. It DID NOT have chytridiomycosis. On post mortem there were kidney and liver changes. Spinal deformity- in humans this type would be called kyphoscoliosis. This is a juvenile L. cearulea so cause is probably developmental. Special thanks to Steve Morrison who found a number of frogs I have photographed living around his property. 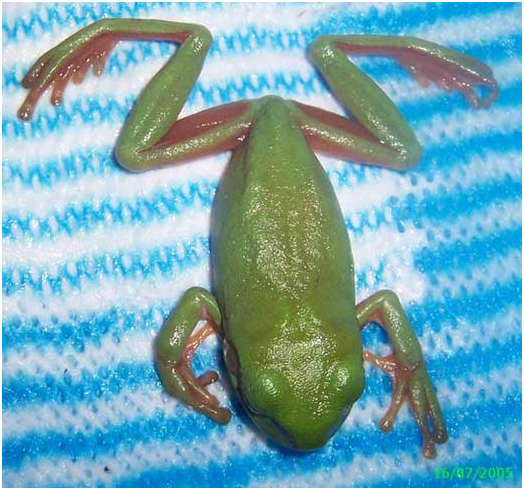 This is a juvenile Litoria caerulea affected by chytridiomycosis. 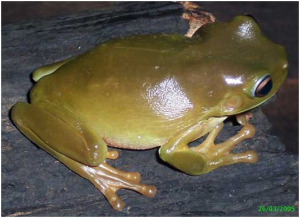 In this photo other than the obvious hyperamia of the feet (and ventral surface – not seen here) the frogs appears and behaves normally. A day later extreme weakness has set in and this is when you see the abducted limbs. 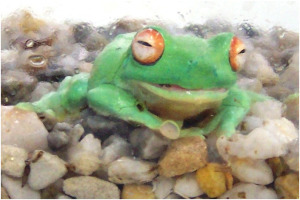 Some frogs appear rigid in the end stages before death. You don’t always see sloughing skin in chytrid affected frogs, and you will see sloughing skin stuck on frogs affected by other diseases that are too sick to wipe it off normally. 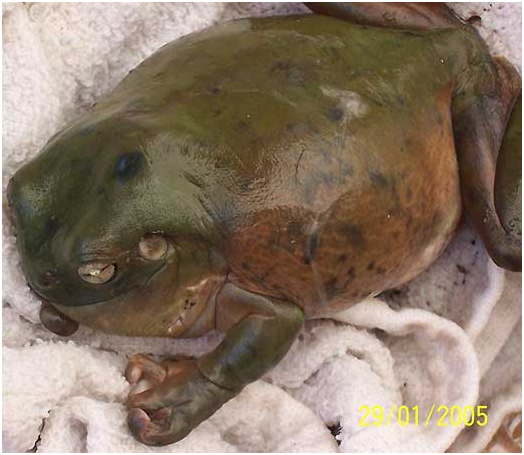 If you look closely at the frog with oedema you will see sloughed skin tags. This is a Litoria caerulea with abnormal colouration. As you know, frogs colouration can vary a lot normally. in the case of green tree frogs, they will look quite dark if they have not been exposed to light – however, once exposed to indirect sunlight they will go a nice bright green quite quickly if they are healthy. 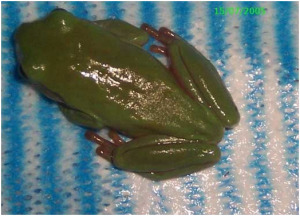 When sick or hyperaemic, they will have the dark dull green look seen here on the front and back ends of this frog, and they will not recover a more normal colour as described above. 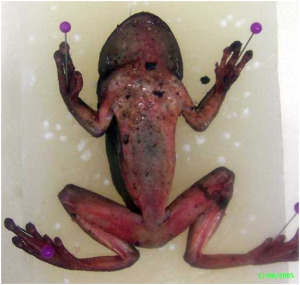 This frog also DID NOT have chytridiomycsis, although it had all the signs – lethargy, hyperaemia and abducted limbs and it was found near a site where chytridiomycosis had killed frogs. 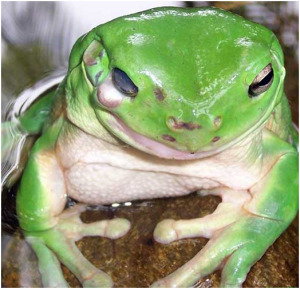 Hyperaemia refers to an increase in blood flow, in the case of frogs an increase of blood flow to the skin is seen as an increased redness as evidenced in this picture. Commonly called “redleg” it is not a sign specific to any one disease. It may mean there is a septicemia occurring or it could be a part of end stage shock. 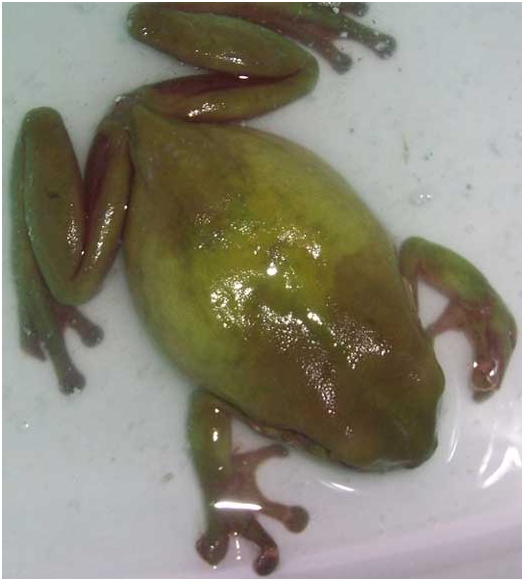 The frog in this picture is dead and in this case did have a heavy infection with chytridiomycosis. There are many causes for lumps on frogs – tumors of course, parasites such as tapeworm sparganosis and skeletal deformities. 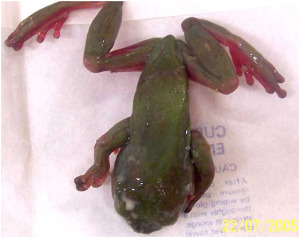 This case is a healing injury to the head – possibly a crush injury, this frog progressed to eventually lose its eye and develop areas of ulceration around the nostril and eye due to nerve damage. Deformities in the development of the skeleton are commonly seen in frogs and may occur due to an imbalance of a number of factors. Vit D, natural light exposure, calcium: phosphorus ratios, growth hormone, melatonin and thyroid hormone. Generally they are seen as long bone curvature (seen in picture of frogs sitting on side of container), spinal abnormalities- i.e. a hunchback (there is a nice picture of this previously) and mandibular (lower jaw) abnormalities -next picture. These are captive raised L. chloris – thanks to Gerry Marentilli (ARC) for allowing me to take pictures. We get many people commenting on a white discharge found on a frog. This is probably the contents of the glands in their skin. They have many skin glands. Many produce lipids and others called the granular glands produce a myriad of substances that can be antibacterial, mimic neuro chemical substances or aid in the immune response. 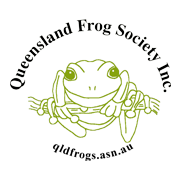 In research conducted to find out what these substances are, the frog is given a mild electric shock so that the gland substances can be harvested. Stress hormones such as adrenaline will also have the same effect. It may be that the gland secretions become obvious when they have been stimulated to release their contents. The frog in this picture died of chytridiomycosis. If you find a frog that has suffered a severe injury (i.e. deep flesh wound, bone break or fracture) you may need to made the call as to whether the animal has much chance of recovery. If you believe it does, then place the frog in a clean, moist container (not too big but with enough space for the animal) with a lid on top to reduce as much light inside as possible. Remove the lid every couple of hours or puncture small holes for fresh air to pass through. 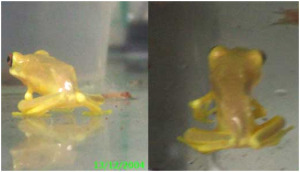 Keep the frog away from direct light and noise and do not put anything inside the container with the frog (e.g. food or shelter). Contact your nearest wildlife vet/hospital to allow them to assess the extent of the injury. In many cases they may decide it best to euthanize the frog, however particular species have had a successful recovery by pinning broken/fractured legs. Others continue to hop after sections of their legs have been amputated! Ensure that if the animal survives recovery and is deemed able to survive in the wild, that it is released back into the same appropriate location and habitat.